We have prepared for you a program for the whole weekend – which means from the 23rd of November to the 25th of November. It is necessary to sign up for programs with limited capacity in advance via e-shop. The team competition for four-member teams, with ten stages inside of the Ilf hotel where you will fulfill tasks based on the Red Dwarf series. Once you have these stages completed you will have the outdoor part ahead of you. Outdoors your goal will be to find the locations on the map and fulfill given tasks there. For a better idea about what is waiting for you, you can watch a video of last year´s competition. Lately, we have been enjoying online quizzes so we will prepare few of them on the topic of the Red Dwarf or geocaching for you. The quizzes are easy for competitors, all you need to have is a mobile phone/tablet with an internet connection (you can also use local WiFi) and you can compete. Do you like hot meals and do you really think you are able to eat everything and in any quantity? Well, in that case, this competition is the right one for you. A series of hot meals are waiting for you to eat. Winner will be the fastest eater or the one who will not give up and stay as the last one in the game. What is the “fermented” fruit? Each year, we have prepared another version of the “What’s for the Fruit” competition for you. This year we have prepared a version for adults, a tasting of fruit wines, where you guess their flavor. A small snack is prepared for the contestant, but we do not recommend to go with an empty stomach. You can take part in the Time´s up card game which is designed for two-member teams. The game has three rounds and in every one of them one member of a team has the task to make sure that his teammate can guess as many words that are on the cards as possible in the given time of 30 seconds. We will use a special version of this card game where you will find words inspired by the Red Dwarf series. 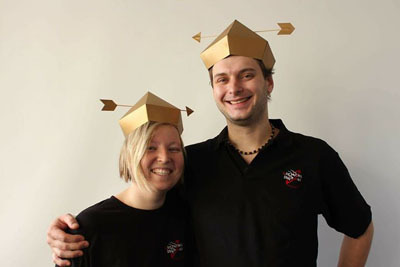 In the Czech republic the original game was released by Mindok. 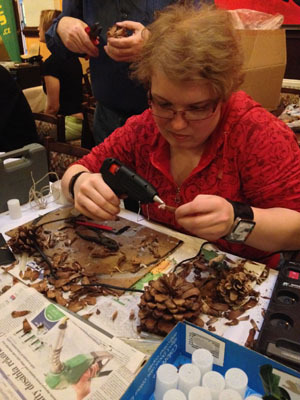 The Czech geocaching association (ČAGeo) and The Geocaching enthusiast club (KGB) Libčice prepared for you a workshop where they will show you that it is very easy to make a nice cache. There will be experienced owners of well-rated caches and handymen in one person, so it will definitelly be worth it. Red cap or a blue one? Aren´t they supposed to be green? Does it really matter!? Let´s make a cap in colour that you like. Do you know how to save life in case of a heart attack? Do you want to repeat how to properly massage a heart, how to call for a rescue, and how to proceed in the event of a fallback? Breathe into the patient? How is it correct? What is AED and hak is used properly? Come to a small first aid repetitorium where you will not only learn a lot of information, but we will be able to try out everything. How to deal with “bigger” bleeding and massive bleeding? Is it at all possible to use the much discussed first aid kit? What does the right “dressing” look like? How is it with strangulation? Let’s try it on the Mini First Aid Repeater. Real masking will take care of a mask that masks injury at the RALLYE REJVIZ international medical and rescue crew competition. At the workshop, we will sign up for your program and learn about its use. We’ll show you how to use the app to make trips and what options it offers. The workshop will take place in a computer room where a local PC is available. If you suddenly find yourself in a megaevent, and you feel like you do not fully understand what’s going on around you, why do we start with the End or why we heat up the soup that is normally fed cold, so you’ve completely missed in your lives with the jewel of television production called the Red Dwarf. But do not despair! This lecture is just here to familiarize you with this legendary series. Lecture about Cachetur.no. Basic introduction and demonstration of trip planning. Geocaching could not function without reviewers – volunteers who spend their free time supervising newly published caches and also the already existing ones. Come to a discussion with the Czech reviewers and ask them about what interests you. We are sure that you will find out some things you didn´t know about their work. The majority of Czech reviewers confirmed their participation. A lecture on the demand for production of the costume series 4000, and what to do with such costume. What is it like when the Red Dwarf fans and actors meet on home ground – or impressions from Dimension Jump. Tracking objects are an integral part of geocaching and geocoins rule amongst them. Slávek Hoblík, who participated in the creation of more than 60 geocoins (including both geocoins with the gazpacho soup theme) will talk about the proces of creation of geocoin – from an idea through design to production. How to travel between Stansted and Gatwick? How much? How do you get from the airport to the capital of Saint Helier for 20 km? Cursed and 3 times visited steel Oak! How did the FTF near Jersey nearly end in disaster? Trams from the last century to the highest mountain of the Isle of Man? English healthcare on its own. And a lot of other beads in the narrative story about the lesser-known “English” islands, performed by Otto Sleger alias Ottik 5. If you do not have problems using your mother tongue correctly or you can even speak other languages, this lecture is the right one for you. You will learn how the Red Dwarf becomes Červený trpaslík and how much energy does it cost. And at the same time we will see the eternal duel „dubbing VS. titles“ from both sides of the barricade. We have prepared for you an exhibition we called Geocoins with a story. Besides hundreds of geocoins to view, you will also be able to read the background information about their creation. 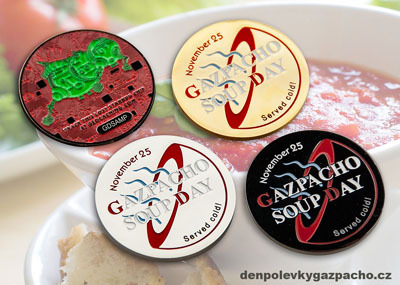 All versions of geocoins with the gazpacho soup theme will be part of the exhibition. CWG has been a part of geocaching since 2005 so it can´t be missed at this event. An exhibition of selected collection of CWGs, including CWGs with the gazpacho soup theme and also CWGs with the vindaloo chicken theme. We have prepared a photobooth where our photograph can take pictures of you with our props, so you can have a nice souvenir from this event. All photos from the photobooth will be here on this website ready for you to download. There is no event without CWGs and its exchanging, this event is not an exception. For all collectors who can´t wait to exchange some CWGs there will be space ready for exchanging CWGs. Where you can exchange as many CWGs as you like. 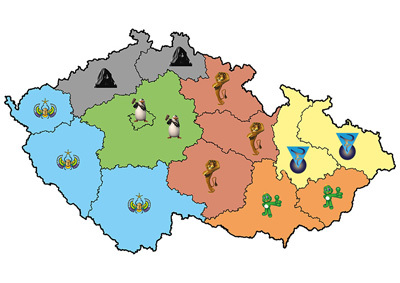 The Czech geocaching association has prepared for you an information stand where you can learn everything about its activities and you will also have the opportunity to ask about everything you are interested in. Every part of the mega event includes labcaches. They will be launched on Saturday at 9 o’clock in the morning.